Each week we share our favourite photos posted in the new Instagram community set up by myself and Alana from Burnished Chaos. If you’re wondering what #funseekingkids is all about, it’s pretty simple really. It’s a new hashtag to use when you post photos of your kids having fun on Instagram. Every Thursday we share on our favourite four images on our blogs and on our Instagram feeds. If you’re a blogger we’ll link over to your blog too. But don’t worry you don’t need to be a blogger to join in. If you’re new to the community please do share the love and let your friends know, we’d love to see some more feeds join us each week. 1. My first choice is from Organised Jo. I love a classic Dad throwing the kid in the air shot! And that beach, well it’s got me into my holiday mood! Little one has got her phonics screening this week. She has been working hard at learning her sounds & words & I’m sure she will do just fine, but I can’t help but be a little bit stressed for her. She is too young to feel any pressure, & I really hope she doesn’t pick up on any from me or school. Love you little one, we are here to lift you up & support you all the way through this education journey. 2. 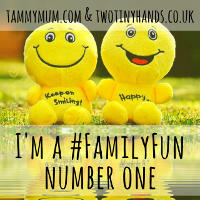 My second pick of the week is from Topsy Turvy Tribe. This is a great family travel feed. And I mean, come on, how much fun does that slide look?! 3. My third choice is this cute one from Lucy At Home of her girls playing in a stream. I love how Lucy just gives up all hope of them not getting soaked! 4. My last choice had to be this smasher from Kelly aka @itsagingerbreadlife. I’ve chosen one of Kelly’s before, and with this face, it’s no wonder! Pure joy right there! Finally, I always add one of my favourite photos of Alana’s. This week I chose this one. You look such an outdoorsy family, I love it!